Comprehensive information of Beijing and Shanghai, China's most visited cities. 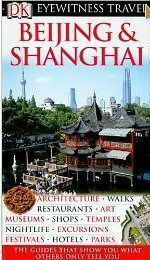 One of DK’s Eyewitness Travel series of guides, “Beijing & Shanghai” offers an introductory section with a fascinating portrait of these great cities and their role in Chinese history, plus an overview of the not-to-miss highlights of each. Typical of these guides, the full color photography. comprehensive maps and charts are outstanding, inviting you to jump right in to the temples, gardens, markets and restaurants. Under 250 pages long, the book is not too heavy to carry around, and includes chapters on both the cities proper, and near day trips, suggested walking tours, plus information on entertainment, shopping, lodging and dining.